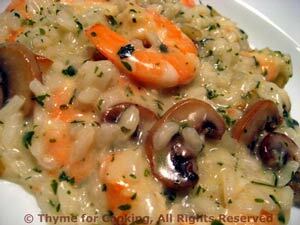 Seafood Risotto, Thyme for Cooking easy gourmet dinner. You can use any combination of seafood or fish in the risotto, or all of your favorite. Get some good bread to serve with the Risotto. 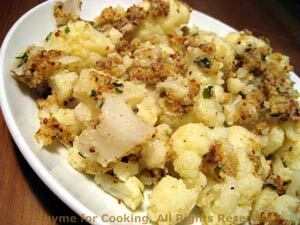 A light coating of bread crumbs, herbs and mustard flavors this cauliflower. For a sharper flavor use hot mustard. Cut cauliflower into pieces, put into a steamer and steam over water for 15 - 20 minutes until fork-tender. In same pan heat oil. Add garlic and basil, sauté lightly. Add mustard and heat through. Add breadcrumbs and stir well. Add cauliflower and stir well to distribute crumb mixture. Serve.